On July 6, Federica Maria Mogherini, the High Representative of the European Union for Foreign Affairs and Security Policy, will convene the Foreign Ministers'meeting on the Iranian nuclear issue in Vienna, Austria. French Foreign Minister Jean Yves Le Drian, German Foreign Minister Heiko Maas, Russian Foreign Minister Sergey Lavrov, British Foreign Secretary Boris Johnson and Iranian Foreign Minister Mohammad Javad Zarif will attend the meeting. State Councilor and Foreign Minister Wang Yi will attend the meeting as the representative of the Chinese side. At the invitation of Austrian Foreign Minister Karin Kneissl, State Councilor and Foreign Minister Wang Yi will pay a visit to Austria on July 5. Q: Just now you announced that State Councilor and Foreign Minister Wang Yi will attend the Foreign Ministers' meeting on the Iranian nuclear issue and pay a visit to Austria. What is your expectation for this? A: This meeting is the first Foreign Ministers' meeting of the existing signatories of the Joint Comprehensive Plan of Action (JCPOA) under the new circumstances. 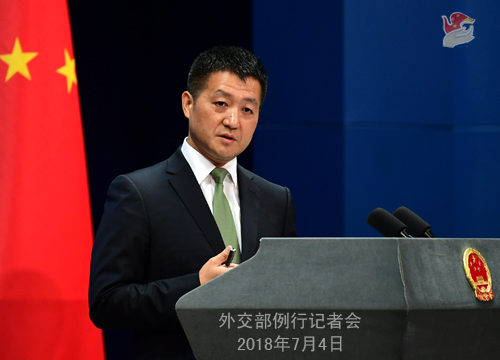 China always believes that the JCPOA is an important outcome of multilateralism and it plays an important role in upholding the international non-proliferation regime and maintaining the peace and stability in the Middle East and serves the common interests of the international community. State Councilor and Foreign Minister Wang Yi's attendance at the meeting demonstrates China's clear-cut position on upholding the JCPOA. We hope that this meeting can send out the clear signal of solidarity and pool the confidence and support of the international community. China is willing to conduct close communication with other attending parties to jointly ensure the success of the meeting. Currently, China-Austria ties enjoy a sound momentum of growth. In April this year, Austrian President Alexander Van der Bellen led a high-level delegation to pay a successful state visit to China and attend the Boao Forum for Asia Annual Conference 2018. The leaders of our two countries decided to establish the China-Austria friendly strategic partnership, which added new dimension and substance to our bilateral ties. China stands ready to work with Austria to follow through on the important consensus reached by our leaders, deepen our mutually beneficial cooperation in various areas so as to deliver greater benefits to our two countries and two peoples. During State Councilor and Foreign Minister Wang Yi's visit to Austria, he will meet with the Austrian leaders and hold talks with Foreign Minister Kneissl, exchange views on bilateral ties and major international issues of mutual interest. Q: The Australian businessman Stern Hu who was jailed eight years ago in the Rio Tinto case is supposed to be released today. I was wondering if he has been released today? If not, when will he be released? A: The Chinese judicial authorities have carried out his criminal sentence in accordance with the law, managed his imprisonment in a lawful, stringent, scientific and civilized way and ensured his legal rights and interests while in prison. Stern Hu complied with prison regulations and disciplines and obeyed supervision and education while serving his sentence. The Chinese judicial authorities reduced his sentence in accordance with the law, and he was released today after completing his sentence. Q: According to reports, China will slap new tariffs on some US goods from 12 a.m. or 1 a.m. on July 6. Does that mark the beginning of a trade war? A: We have taken similar questions previously. The Spokesperson of China's Commerce Ministry has stressed explicitly that the Chinese side is well prepared and that as long as the United States releases the so-called proposed tariff list, we will take all necessary, comprehensive measures to resolutely safeguard the interests of our country and people. Q: A US chip company Micron accused a Chinese state-backed company on the mainland as well as a company from Taiwan of stealing technology. The Fuzhou Intermediate People's Court yesterday banned Micron from selling some of its chip products. Does the timing of this court ruling of temporarily barring Micron sales have anything to do with the current China-US trade tensions? A: According to my understanding, this is an individual commercial case on the intellectual property rights protection. As to the specifics, I may refer you to the competent authority. I would like to emphasize two points here. Firstly, China is a country under the rule of law and we act in strict accordance with the law. We provide equal protection for all enterprises, be they Chinese or foreign ones, state-owned or private. Secondly, China is always committed to creating a law-based and enabling business environment for Chinese and foreign companies alike. As to whether this has anything to do with China-US trade frictions, I do not think there is any necessary link between them. 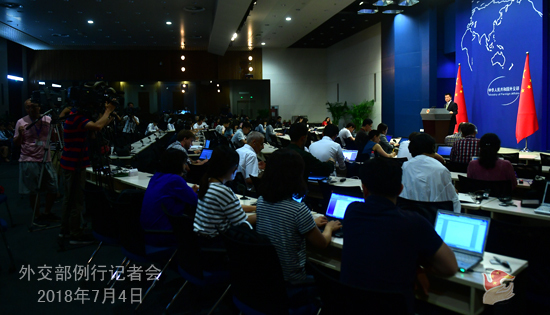 Q: Reports say that China has asked the EU to issue a strongly-worded joint statement in response to US trade policies at the China-EU leaders' meeting to be held in mid-July, but that request was refused by the EU side. What's your comment? A: This year marks the 15th anniversary of the China-EU Comprehensive Strategic Partnership. During the upcoming 20th China-EU leaders' meeting in mid-July, the leaders of the two sides will exchange in-depth views on China-EU relations and major issues of mutual interest. Now the two sides are stepping up preparatory efforts and we will issue relevant information in due course. As to whether China and the EU will reach certain common understandings or publish our joint stance on the current situation of global trade and investment and other related issues, I would like to remind you that during the China-EU high-level economic and trade dialogue just concluded last week, the two sides reached important consensus on deepening and expanding China-EU economic and trade cooperation and advancing economic globalization. Both sides believe that we must firmly oppose unilateralism and trade protectionism, promote bilateral trade cooperation with pragmatic measures and jointly uphold rules-based multilateral trading system. Although one single dialogue is far from enough to resolve all problems, China-EU cooperation will move steadily forward to inject positive energy into China-EU relations and the changing world as long as we remain committed to a win-win approach. Q: If China would impose the tariffs at 12 or 1 a.m. on July 6, that would mean that the Chinese tariffs come before the US ones, technically because of time differences between the two sides. Could you clarify it? 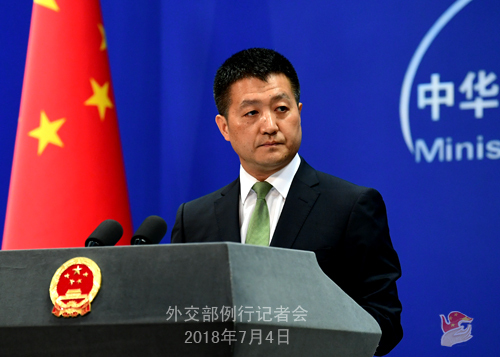 A: The Spokesperson of China's Commerce Ministry has stressed explicitly that the Chinese side is well prepared and that as long as the United States releases the so-called proposed tariff list, we will take comprehensive and necessary measures to resolutely safeguard the interests of our country and people. I believe that the logic of this statement cannot be more clear-cut. As to the specifics mentioned by you, I may refer you to the competent authority.